Cloudy With A Chance of Meatballs premieres on September 18th! The film is adapted from the children’s book written by Judi Barrett. Phil Lord and Chris Miller (Clone High) are the co-directors and co-writers. Justin Thompson, Production Designer, compiled an amazing visual development team. Carey Yost, Mark Colangelo, and myself were responsible for the final character designs. I am honored to be part of this film. Go see it! Here are some posters I designed for Flint’s bedroom. I will post some character designs when the film opens. The Art and Making of Cloudy with a Chance of Meatballs is now available. Special thanks to Tracy Miller-Zarneke. Hi Pete! Just AMAZING work... I saw the art book in Borders and had to pick it up. It's one of the best put together art books I've seen. Such a treat to see additional stuff here. I look forward to more! The book is indeed insane! Looking forward to finally seeing all the work you guys put into this. I'd love to have one of those posters in my room! i'm SUPER excited about this film beCAUSE of the designs... i love 'em. you're awesome. can i kiss your feet? hah... no seriously. Looks like you had a lot of fun on that show. Come visit us at DW's somtime! Hey Pete kudos! Those are very refreshing CG characters! Looking forward to the movie and will definitely get the book. Love the Tesla poster, that one cracks me up. Awesome! Any chance you could post a bigger version of the Tesla poster? Its awesomeness distracted me every time it was on screen! Pete ! we loved the posters in the movie. we would love to be able to buy them if they are available ? please let us know ! kaz, jack and aidan ! i am sorry sir but must know if i can get a nikila tesla rockstar scientist poster anywhere. i saw that movie like 4 times in a row and that poster stuck with me. you are a fantastic artist and i hope to be as aweseom as you someday. please please please tell me there is somewhere i can get one. i looked for quite a while expressly to find your site. I haven't even seen the movie, but friends with kids told me about the Tesla poster! any chance of a print? I'm with MrMunkeePants on this one, I'd love a full sized print. Oh my gosh I am nerding out so much over these. I love them! And count me in for prints too! I'd buy both Tesla and Newton! And the beakers. 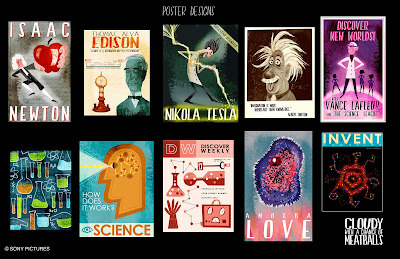 Agree with seemingly everyone--would really like to be able to buy the Tesla poster! Searching for it led me to your blog--great work, by the way. I NEED the Tesla poster... awesome work. Tell us the way to got it. Where can I find the poster of Nikola Tesla? It's amazing! is it avaliable for sale o for donwload? so after searching endlessly for a tesla poster I coppied and cropped out the picture. then printed it and tacked it to the wall. where it will stay till I find an actual poster. totally awesome. I too would love to own one of there posters, especially the Tesla one. It is, verily, quite frickin' awesome. I have been looking for a copy of the Nikola Tesla poster EVERYWHERE. If you have a site where I can buy it in nice print to frame, please tell me!!! These are all so great. I love the balance of retro and funkiness to them. Please please please! I need a Tesla poster!! Love that Tesla poster. Is it available for sale anywhere? I'd like to buy one for my daughter. I would love love love the rockstar Tesla poster for my boyfriend!! He would go crazy for it! Please let us know if it becomes available in poster size? Please let us know if you create any posters for purchase! NEEED that Tesla poster. PLEASE get back to us when we can buy it! u are awesome! i love it so much! can i have a Tesla poster! how can i get it! These are spectacular! Definitely one of the little details that really made the movie shine. I, too, have been coveting the Nikola Tesla Rockstar Scientist poster. I do hope they'll become available for purchase some day. Do you think Sony would consider devoting an entire animated feature to Tesla? Without his innovations, neither rockstars nor scientists would be what they are today. After I saw the film in the theater I started looking for these posters to be merchandised. I may have been blind (surely Sony would have realized how well they'd sell), but I couldn't find them. Are they available anywhere? I keep coming back every few months to see if I can find a Tesla poster for sale. Any chance that will happen? I loved the movie, btw.